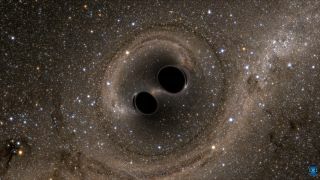 An artist's depiction of two black holes colliding to merge into one, an event that led to the Nobel Prize for Physics winning detecting of gravitational waves by the Laser Interferometer Gravitational-Wave Observatory. The physics world awoke to news of new Nobel Prize recipients today (Oct. 3). The Nobel committee awarded the 2017 Nobel Prize in physics to the three scientists who discovered gravitational waves. Half of the prize will go to physicist Rainer Weiss of MIT, with the other half split by physicists Barry Barish and Kip Thorne of Caltech. The three scientists founded the Laser Interferometer Gravitational-Wave Observatory, (LIGO), which first detected gravitational waves in 2015. Gravitational waves are predicted by Einstein's Theory of Relativity. When supermassive objects come together, like merging black holes, they create ripples in the structure of space-time. LIGO's two observatories each have two arms 2.48 miles (4 kilometers) long and arranged in an "L" shape. They use lasers to measure the changes in an arm's length caused by gravitational waves flexing and squeezing space-time itself as they pass through the detector. The first gravitational wave detected in 2015 was the result of a collision 1.3 billion years ago, between two black holes that were 29 and 36 times more massive than the sun. However, the effects are nearly imperceptible. LIGO's detectors are sensitive to differences 10,000 times smaller than an atomic nucleus, according to a description on the facility's website. The winners weren't exactly a surprise, given the magnitude of their discovery. Many thought the three scientists would take last year's prize, but apparently the publication didn't make the cutoff date. Still, the response has been jubilant on social media. Read Caltech president Tom Rosenbaum's message to the community celebrating 2017's #NobelPrize in Physics winners. "We are delighted and honored to congratulate Kip Thorne (BS '62) and Barry Barish of Caltech and Rai Weiss of MIT on the award this morning of the 2017 Nobel Prize in Physics" Rosenbaum said. "The first direct observation of gravitational waves by LIGO is an extraordinary demonstration of scientific vision and persistence." Weiss offered his own reflections on the award, and what the work has meant. Gravitational waves, like sound waves, have a cycle, or frequency, as they travel. Caltech converted the waves' frequency into sound, generating the characteristic chirp. @CERN, home of the Large Hadron Collider, offered its congratulations to the three prize-winners. To add to their honor, @MIT immortalized the prizewinning scientists as Lego LIGO leaders.